We are able to provide confident diagnoses and precise treatment planning while minimizing radiation exposure to patients through the use of 2D and 3D imaging. 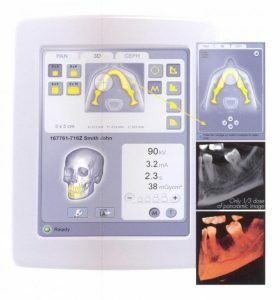 3D technology of the Instrumentarium OP300 Maxio allows us to view the entire maxillofacial region and put together comprehensive treatment plans that are easy for patients to see and understand. This new machine is designed with the patient comfort and safety in mind. The upright structure accommodates patients with limited mobility including those in wheelchairs. With Low Dose Technology (LDT) and Automatic Dose Control (ADC), radiation exposure levels are customized to patient size and exam type.